Just what is this idea of bird communication? Imagine for a moment that you are strolling down a boardwalk through a cattail marsh in your local wetland. It is springtime and many bird voices fill the warming air and reach your ears. You hear the loud, carrying voices of some birds in the cattails who's song sounds like konk-la-ree-er! or poke-your-neigh-bor! 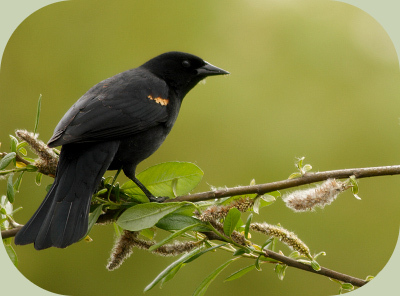 Then you see them, black birds clinging here and there to the upperparts of the cattails and belting out their songs. You continue walking along the path and the birds nearest to you quietly slink down into the inner depths of the cattails. The singing of all these birds is almost overwhelming! As they sing out using their own personal form of bird communication, they fluff up their wings and gesture to each other. Red and yellow patches of feathers on their shoulders grow out like fiery flowers with each of their outbursts. Occasionally, one lifts off from the cattails and flies towards another bird perched nearby. Wings pumping in exaggerated slow motion, red and yellow patches bursting from the wings, they call out as they fly. What you just witnessed was the loud and exciting displays of the male red-wing blackbirds (Agelaius phoeniceus). Also, you just witnessed bird communication on several levels. The first thing you might have noticed was the sounds the birds were making. The voice is often the most noticeable form of bird communication. Bird communication using sound includes singing, calls, squeaks, squawks, gurgles, warbles, trills, rattles, gulps, pops, whines, clicks, croaks, drums, whistles, howls, tremolos, thumps, honks and many other sorts of sounds. Not all birds use their voice as their main method of communication. 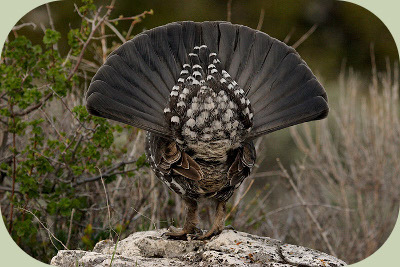 Some birds, such as the ruffed grouse (Bonasa umbellus), make non-vocal sound by beating the air with their wings. This is done in a way where the wings create a vacuum and the sound is caused by the air rushing in to fill up that space, essentially creating a mini-sonic boom. This sound is used to establish and hold a territory. Another example, the Wilson’s snipe (Gallinago delicata) uses special tail feathers which its spreads during an earthward dive. As it plummets down, it beats its wings in a way that guides air through the feathers creating a winnowing sound. The snipe uses this during courtship. Bird communication also happens through visual displays. These are often a combination of behaviors and the feathers on the bird’s body. In the case of the blackbirds, the males puff up their feathers, lean forward, shrug their shoulders showing off their colorful shoulders, and exaggerates them with bold postures. They also sing out as they do this making their statement loud and clear. So it is with many species of birds, both the visual and sound-based behaviors are used to communicate. 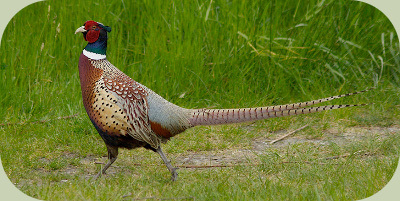 Birds use their voices to make sounds for all sorts of reasons, such as: claiming territory, seeking mates, begging for food, calling their chicks or mate, staying in touch with flock mates, scolding an intruder of the same species or different species, announcing the presence of a predator, singing a duet with a mate and many other reasons. Sound is a great form of bird communication because it can carry beyond where birds can see. In some cases, sounds can travel over a mile or several miles under the right conditions. Also, if you are a bird that lives in a thicket, it helps to use your voice to stay in touch with your mate or with the members of your flock. Birds also tend to have very keen eyes so it is no surprise that visual displays are included in bird communication. Consider the male red-winged blackbirds. They have deep, black colored bodies, black wings, black heads and eyes, black tails and those brilliant red and yellow wing patches. The red and yellow colors contrast starkly with the black, making these birds stunning to look at in full display. The way in which the males flash their brilliant wing patches as they sing adds to their messages. Both gestures together are used by the birds to try and communicate that they are claiming this patch of the cattail marsh as their territory. The displays don't go unnoticed by the females either. Females of most bird species are generally duller looking in color compared to the males. Females are also very critical of the appearance of males, and when choosing a mate they don't just listen to his song, but also closely scrutinize his appearance. Why, you might ask? The healthier and more impressive a male birds feathers are, the healthier are his genes. Females want to mate with only the best males. If he sings well and has great plumage, she will want him to father her chicks. Visual displays are not about a bird's feathers, but also includes how a bird uses them. Consider a male peacock's beautiful tail. It is not enough for him to just have a beautiful tail, he also has to flaunt it many times everyday to get the attention of the females. Same is true of the blue grouse in the photo above. Though some birds communicate largely through visual displays or sound, most birds use some combination of both. Can we understand bird communication? Yes, it is possible for us to learn to understand bird communication. For example, the beautiful visual displays of a peacock or red-winged blackbird, or the enchanting song of a wood thrush or Swainson's thrush communicates to all of us on a personal level. That personal experience and the meaning we gain from it is different for each of us. It is also possible to understand bird communication in the context of how the birds themselves might understand it. For starters, nothing birds do is without purpose. There are many levels of meaning in bird communication. On one level we can observe the colors and patterns on a bird, and recognize that it is sending a signal to other birds. One signal that it is sending is, "I belong to this species." Each species of bird looks and sounds different, this helps to distinguish whether a bird is a possible mate or not. On another level, we might pay attention to the physical behaviors of a bird. For instance, is the bird feeding calmly or is it flying away and hiding in cover from a potential threat? Since birds can puff out or flatten down their feathers at will, how the feathers look might help understand how a bird is feeling or what it is trying to communicate. A bird that suddenly puffs itself up might be expressing the intensity of its current feelings. The raising of a birds crest might mean it is feeling aggressive, excitement or curious. A rigid, jumpy posture might mean it is frightened and ready to flee. Slower, more deliberate movements might show you that a bird is feeling relatively relaxed and calm. A wealth of information on a bird's state of mind is to be found in the nuances of their behaviors and the intonations of their calls and songs. There is also a way of studying bird communication that allows you to use the sounds and behaviors of birds to tell you about other, more elusive animals in the forest. This is described as the study of "bird language." For more information on this, check out another one of our articles here: Using Bird sounds to Locate Animals. Bird communication changes with the seasons and times of year in any given location. In the United States, birds are strongly affected by the four seasons. Winter, for instance, is often the quieter time of the year as far as bird vocalizations in the northern parts of the USA. Spring is when the bird song returns and singing begins again in earnest for many species. Birds of many migrant species are returning to their seasonal nesting areas, are busy establishing territories, finding mates, making nests, finding food and many other tasks. Summer time is often when birds are busy keeping their growing chicks fed and helping them reach independence. Singing slows down for those species which are raising chicks because now practically all of their time is consumed in taking care of their family. Fall is a time when the migrant birds start to move south again. And the cycle continues, onward. Where can you go to start learning more? The best place to start learning more about bird communication is right in your own backyard. Try getting to know the birds that frequent your neighborhood by setting up a feeder in your yard. Watching birds at feeders can provide many hours of close-up viewing of bird behavior and allows you to observe birds over a period of time. Take note of how the birds communicate between members of their own flock or species, as well as with other birds and wildlife. With time, you will gain a deeper understanding of the intricacies of bird communication. Go outside and enjoying watching birds today! Return from Bird Communication back to Birding Articles.